by Henry Sakaida, Gary Nila and Koji Takaki. Catalogue Number: I-400 - Japans Secret Aircraft-Carrying Strike Submarine. 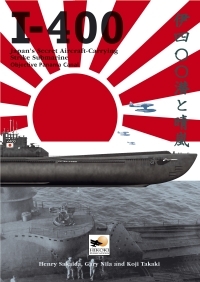 Media and Contents: Hard cover, 144 high-gloss top-quality pages with many colour and black and white photos never seen before plus line-drawings and colour art-work of both the submarine and the Seiran aircraft. Advantages: A good easy read, a subject about which very little is known out-side of Japan its self., of interest to ship and aircraft modellers and historians. I've heard a tiny bit about both the I-400 and the Aichi Seiran float plane but I never put them together. I had no idea how big this sub was or how well the Seiran flew let alone the plan to bomb the Panama Canal. So this book comes as somewhat of a revelation to me, as I guess it will to many others. The Authors are a Japanese American, Henry Sakaida, an American ex policeman, Gary Nila and a Japanese Businessman, now retired, Koji Takaki. With Henry and Gary collecting data, checking facts and interviewing those involved in America, Koji did the same in Japan and between the three of them they've come up with a book that is both interesting and easy to read. There are seven chapters and eleven appendices with lots of interesting data and illustrated with many photos never seen before and lots of colour art-work plus line-drawings of both the ship and aircraft. After the Author’s introduction, there are two Forewords by two of the crew then Chapter One. This describe the Japanese Submarine Service before and during the war. Chapters Two and Three describe in great detail the I-400 class of Aircraft-Carrying Submarines and the Aichi M6A Seiran Submarine-based Attack-bomber. Chapters Four and Five cover the planned attack on the Panama Canal and the later operational plans after the initial one was cancelled. After these plans were also axed because of the wars end, Chapter Six covers the struggle to return to a home port before capture and Seven, the submarine’s transfer to Pearl Harbour by an American crew and final voyage and sinking. Spread throughout these Chapters are histories of various crewmen who were still alive when the research was being carried out plus small pieces on things like the living conditions on board a Japanese sub and the atrocities carried out by some of the Commanders while on earlier submarines. At over 400 ft long and 3,350 tons surfaced, this is a big boat. Consider if you will, a US Gato was around 1500 tons surfaced, a British T class around 1300 and the German Type IX, a measly 1000 tons. This submarine was bigger than any WWII Destroyer and her submerged displacement of 5,223 tons puts her almost on a par with a Light Cruiser. Until the nuclear boats of today were begun, the I-400 class were the biggest ever built. The hanger tube, between the conning tower and hull, could carry three aircraft with their wings folded and floats removed. The eleven Appendices cover many smaller pieces such as Japanese Navy Ranks, I-400 Radio Equipment, Report of Dry-dock Examination and Seiran Take-Off Procedures among others. Apart from an interesting read, this book would be very helpful to any modeller building a Tamiya Seiran or scratch building the ship not to mention its historical value.